The best inflatable fishing boats are designed to provide you with memorable moments on the open water. They are ideal for pools, lakes or places where water is calm. Ideally, they are great purchases for those who live far away from the open water. This is because they are inflatable; hence, unbelievably easy to carry to and from the water. What’s more, most of them come with pumps for easy inflation as well as a carry bag for easy storage. To make it easier finding a suitable one, we have compiled the following products. So, read every review with confidence knowing that you will have a good boat at the end of it all. This inflatable fishing boat is first on our list with a reason. It weighs just 26 pounds, and this means you will have no problem carrying it from place to place. Despite being so lightweight, this inflatable kayak can carry up to two people. This means it is the ultimate weekend gateway boat, especially if you have your better half. The durability of this fishing boat is impressive, given that it is made of high-frequency welded seams and 9-inch tubes. Plus it boasts I-beam construction. Well, such strong craftsmanship enables it to carry up to 500 pounds. 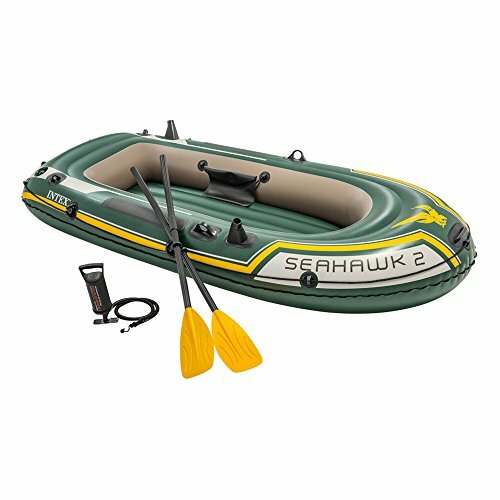 The boat comes with two oars, a reliable foot pump for inflating it, a carrying bag for easy storage after it has been deflated, inflatable front and rear seats, and spray skirts. It also comes with a limited 3-year manufacturer’s warranty to give you confidence in buying and using it. The first product on our list is meant to carry two adults. 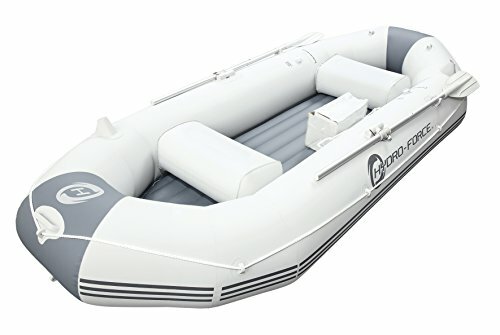 Now even better, the HydroForce Marine Pro Inflatable Raft carries two adults and a child. In general, it has a weight capacity of 594 pounds. And for its price, we think that’s a bargain. 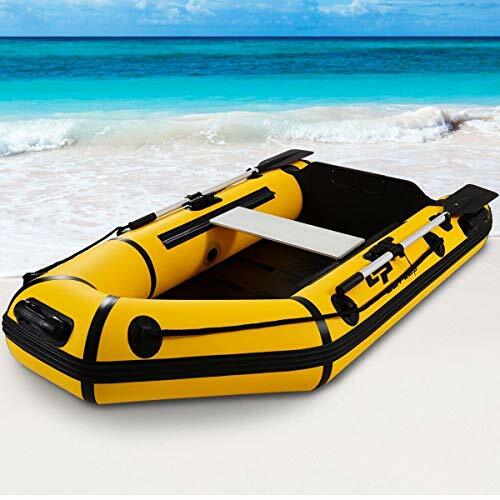 What’s more, the price seems not to affect the quality, considering that this inflatable raft can stand up to even the most extreme nautical conditions like exposure to UV rays and petroleum. Well, its strong build is due to the top quality marine-grade material used to make it. The boat will serve you for years to come because of its durability and superior strength. 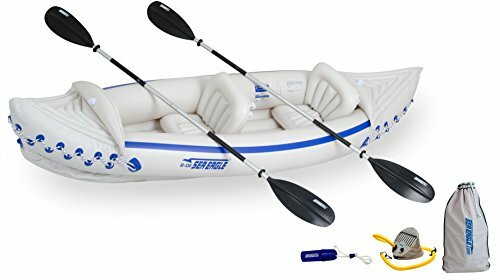 It comes with a pair of 60-inch aluminum oars, a 14.5-inch air pump, and a storage bag, which comes in handy once you are done using it. Furthermore, it has an impressive size of 115 x 50 x 18 inches. The list seems to be getting better and better as far as the boat capacity is concerned. 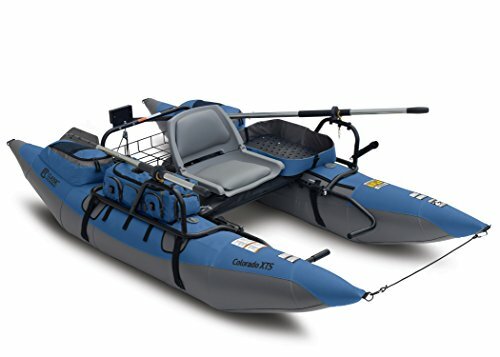 That said, this inflatable fishing boat measures 144 x 66 x 17 inches, and it can carry up to 5 people. It is a high capacity fishing boat that is great for a large family or a day out with friends. Although it is incredibly spacious, this boat is built with portability in mind. And that can be well illustrated with the compact and lightweight design. Moreover, this boat is very easy to assemble, meaning you can get it ready for water in a snap. Its inflatable I-beam floor is super comfortable yet very rigid. Once you are done deflating the boat, there is a carry bag that ensures easy storage and transportation. The boat also comes with a pump for easy inflation as well as two oars that are 54 inches long (each). The challenger is a boat made with passion. It measures 30 inches wide by 15 inches high by 138 inches deep when inflated. And it boasts a maximum weight limit of 400 pounds, meaning it can carry up to two people. 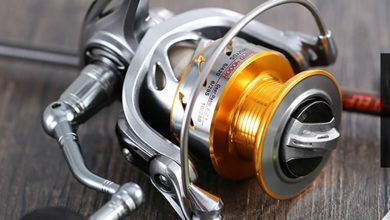 Intex has designed it with the strongest materials one can think of to enable it to overcome anything it faces while on a fishing adventure. 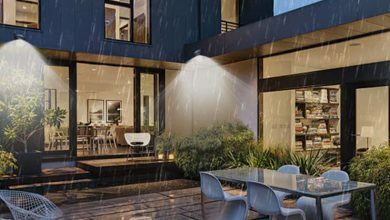 The material used is none other than the rugged, Super-Tough vinyl, which is both puncture-resistant and UV damage-resistant. Because of this material, expect this inflatable fishing boat to be ready to serve you for years to come. The sporty and fun design makes this kayak look great in water. There is also a streamlined finish to give you an easy time paddling your way while fishing. 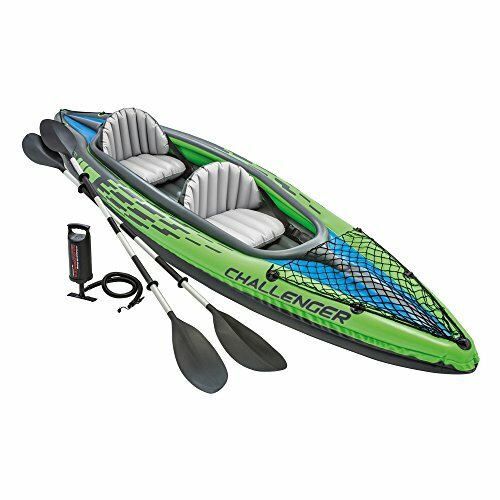 Also, the manufacturer has settled on light green and added sporty graphics to make the kayak very visible in the water. Another finely constructed boat that you will be more than happy to own is this one from Goplus. It is crafted with three layers of 0.9mm PVC material. The super strong material has the ability to overcome saline-alkali, corrosion, aging, and damages as a result of sunshine. Between the PVC materials, there is a layer of iron mesh, and its role is to increase wear-resistance as well as to make the boat body harder. Goplus has not stopped there; it has gone ahead to make the deck with durable marine wood floors that are equipped with aluminum framing. This makes the deck hard enough to stand on. Well, due to superior construction, you do not expect the boat to disappoint when it comes to maximum weight capacity, do you? That being said, this boat boasts an impressive weight capacity of 400 pounds to mean it can carry two fishers/cruising sailors at the same time. We said it earlier that this article keeps getting better and better and we don’t plan to change those words any time soon. That’s because we have just bumped into the latest model of an inflatable fishing boat, which is good enough to get your attention. The boat has an amazing weight capacity of 790 pounds, and it measures 9’8” x 4’6” x 1’5”. With such an incredible size, this boat can carry up to 3 people simultaneously. It is constructed with heavy-duty puncture-proof PVC to provide it with the much-needed durability without compromising comfort. And its floor is made of inflatable I-beam construction for unrivaled rigidity. What’s more, this inflatable fishing boat comes with 3 air chambers to make it even more floatable. 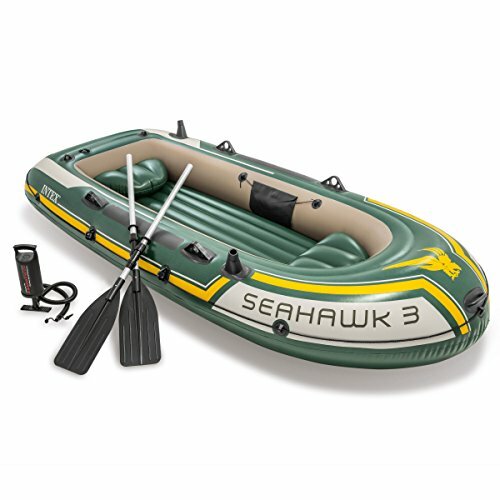 Plus it comes with the manufacturer’s high-output pump for effortless inflation as well as a pair of 48” aluminum oars. We are certain that you will always be looking for the next adventure if you have this inflatable fishing boat. It is a 2-person boat for fishing that makes a great purchase for those couples who enjoy outdoor adventures. It comes with two built-in fishing rod holders to securely hold your fishing rods when you are not using them. It also comes with a gear pouch for ultimate convenience. Its 3 air chambers include inner auxiliary chamber inside hull, and they help keep it afloat. There are also motor mount fittings for adding the Intex motor bracket as well as a trolling motor. The included repair patch kit ensures that at no time will you be stranded because of boat damage. Other accessories that come with this boat are welded oar locks, all-around grab line, and oar holders. This boat is exactly what you should go for if you want to take your fishing experience to another level. 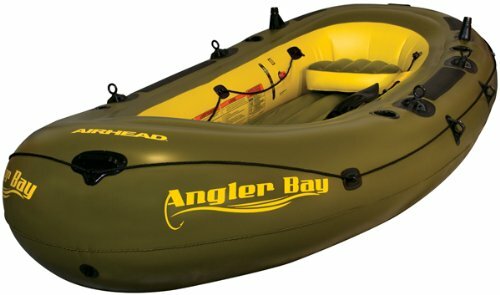 Airhead knows that nothing makes fishing adventures better than an inflatable fishing boat. That’s why they have come up with the best fishing boat no one has ever seen. The boat is large enough to carry up to 6 anglers or cruising sailors. This means it is the go-to fishing boat if you are looking for a stunning way to enjoy your time out with your friends or the entire family. This boat is also available in other sizes that can carry 3 and 4 people. 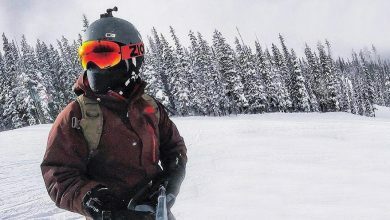 It is made out of a heavy-duty vinyl material with electronically welded seams, so it can provide you with a solid performance. Its floor, on the other hand, is inflatable to provide you with the convenience you need. Still, on convenience, the boat has a movable seat, which you can move around to suit your needs. It comes with two fishing rod holders, and it is equipped with several drink holders. A boat with a swivel seat! There is no way we could leave it out of these wonderful reviews. The swivel seat will make your fishing task much easier than you can possibly imagine. Whether you want to catch a fish behind you, just turn around, and boom! The fish is all yours. Another amazing feature of this inflatable fishing boat is the two-position motor mount (motor not included) that will allow you to equip the boat with a motor to enhance its performance. The boat also has a transport wheel, which ensures effortless access to your favorite fishing spot. Its huge storage capacity has two insulated drink holders for keeping drinks to help spice up your moments. The storage capacity also has 20 pockets where you can keep accessories. Moreover, there are removable side pockets that combine to form a portable gear bag. Swimline is the creator of the original giant swan float. This means there is no way you will go wrong with their products. 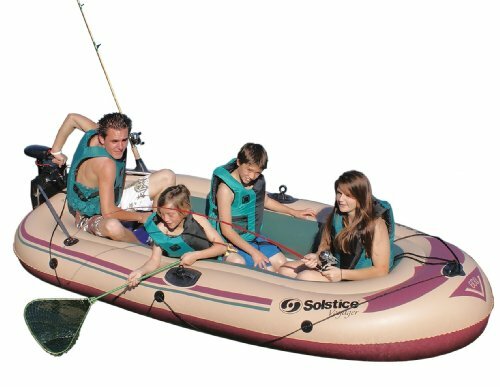 And one of those products is this 6-person inflatable fishing boat. 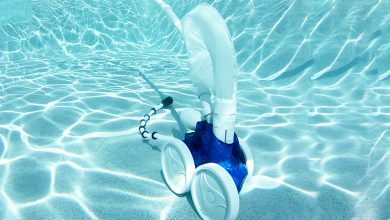 Swimline was founded in 1971, and since that time, they have grown to be one of the largest manufacturers of swimming pool liner, maintenance equipment, toys, and gaming products. They have designed this 6-person boat with versatility in mind. They have also made sure that it is sturdy enough to stand up to elements. Hence, to achieve that, Swimline has made the boat with durable PVC construction. The boat comes with a fishing rod holder, swivel oar locks, and inflatable seats. It is great for use in the lake, pool, and any place where the water is calm. 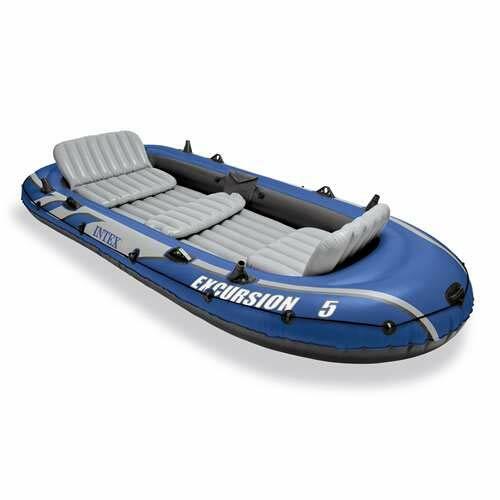 Whether you are fishing, rowing or just relaxing, this inflatable boat for fishing is for you. The following should be in your mind before you buy an inflatable fishing boat. Different inflatable boats for fishing have different weight limits. And it is the weight limit that determines the maximum capacity of a boat. This means that if you are looking for a boat, let’s say for two, then check the weight limit to make sure that it is within the bracket of the weight of at least two adults combined. You are buying an inflatable fishing boat to provide you with a “feel-good” factor while you are fishing. However, this may not be the case if you settle for something less comfortable. So, ensure that your boat is comfortable enough to put you in a relaxed position while fishing. A boat that is easy to set up should be a frontier for you. For this reason, consider boats that come with pumps and require no additional tools to be set up. Also, make sure that the boat can be set up by a maximum of two people if not one. Since your boat is inflatable, you run the risk of getting a puncture when it rubs against sharp rocks. As such, you must make sure that the boat you are set to go for is made of durable materials like PVC. How long does it take to inflate an inflatable boat? This depends on the pump you are using to inflate the boat. That being said, an electric pump inflates boats the quickest, while a foot pump inflates boats fairly fast. Hand pump, on the other hand, does not work as fast as the other two, though it gets the job done. This depends on how you care for your boat. For instance, your boat is likely to last up to 10 years if you maintain it according to the manufacturer’s instructions. Can I mount a motor to my inflatable fishing boat? A motor cannot be attached to an inflatable boat. 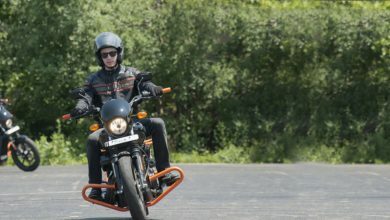 Nevertheless, there are some that are designed to be used with a motor. Here, we do not just provide you with a list of the best products but also we make sure that you understand this topic of inflatable boats for fishing well. With that said, we highly encourage you to go through each line. This is because you will be more knowledgeable about the topic than ever before.